A cross-sectional study was carried out after obtaining permission from Institutional Ethics Committee. • Administration department (AD): All administrative functions of the factory are done here. Subsidized canteen facility is also available in the factory. For analysis and internal comparison; SMS, RMS, and QCD were taken together as exposed group (EG); as they were involved in production and direct exposure to factory hazards, which included a total of 239 workers, out of which 213 participated in the study, as workers working in these sections were exposed to working environment continuously during their working hours. While MD and AD were taken as nonexposed group (NEG); which had 197 workers working in this section, out of which 187 were included in the study. The factory works continuously round the clock in three shifts of 8 h each (6 am-2 pm, 2pm-10 pm, and 10 pm-6 am). Posting of worker in particular section was of permanent nature. The shifts of workers were changed in rotation at the interval of 1 month. Total number of workers working in the factory was 436. Out of this, the eight female workers from administrative area were excluded from the study, as there was no comparative group in productive area. The temporary or contractual workers, (22 in number), were also excluded from the study. Two workers were employed for less than 1 year and four workers did not consent for the study, hence excluded. Hence, a total of 400 workers were included in the study. Out of these sections, first three sections were involved in production and direct exposure to factory hazards, so considered as EG) with - Out of all sections, three sections (SMS, RMS AND QCD) were involved in production and direct exposure to factory hazards, so considered as EG (Exposed Group). Total number of workers included from these sections was 88, 79, and 46 from the total of 98, 89, and 52, respectively. The MD and administrative department were not involved in production and so included in Non Exposed Group (NEG). A total of 103 and 84 workers were included from these MD and administrative department from total workers of 110 and 87, respectively. All the permanent workers working in the factory for more than 1 year and gave consent for the study were included in the study. Workers employed on contractual/temporary basis, workers working for less than 1 year, and female workers; (as there was no female workers in the EG), they were excluded from the study. The study was conducted for a period of December, 2011 to May 2013. After obtaining the consent from institute's ethics committee, a written permission for the study was obtained from the concerned authority of factory. Workers' detailed information regarding profile was taken in pretested questionnaire format after obtaining the informed consent and explaining the purpose of study. Approximately, five to seven workers were examined daily in a separate room allotted by the management. Workers were also interviewed regarding their years of job, job satisfaction, usage of protective devices, and history of injuries during work. Workers' detailed general and systemic examination was conducted. Systolic BP: The pressure at which the Kortkoff sounds first heard. Diastolic BP: The pressure at which the Kortkoff sounds first disappear. The data was entered and analyzed on computer using software Epi Info version 6.04. Percentages were used to describe sociodemographic profile and morbidities. Odds ratios were calculated to study the association and P < 0.05 was taken as significant. A cross-sectional study was conducted in an iron and steel industry among 400 workers. Out of the total, 213 (53.25%) were included in Group A, that is EG, which included workers from SMS (88), RMS (79), and QCD (46). In other group, that is, in Group B (NEG group), 187 (46.75%) workers were included, which include workers from MD (103) and AD (84) [Figure 1]. [Table 1] shows age-wise distribution of workers. Majority of workers 170 (42.5%) belonged to age group of 35-44 years, of which 86 (50.59%) were in Group A, while 84 (49.41%) were in Group B. The minimum number of workers were in the age group 18-24 years (16,4.00%); out of them 15 (93.75%) were in Group A, while 1 (6.25%) was in Group B. All the workers were male. [Table 2] shows education-wise distribution of workers. It has been observed that maximum number of workers had education of middle school level, that is, 30%, out of them 76 (63.33%) were in Group A, while 44 (36.67%) were in Group B; followed by education up to high school (24.25%). Only 2.5% were postgraduate. Majority of the workers (48%) were educated up to middle school and thus, were ignorant about the disadvantages of their occupational environment to which they were exposed. [Table 3] shows distribution of the workers according to length of service. It has been observed from this table that maximum workers had work experience of more than 20 years, that is, 38.75%, out of which 52.90% were in Group A, while 47.10% were in Group B; followed by experience of 10-15 years (24.25%), of which 47.42% were in Group A, while 52.58% were in Group B. Majority of the study population were in the EG for more than 20 years, making them prone to disadvantages of occupational exposure for a prolonged period. [Table 3]. According to Modified Prasad classification of socio-economic status, maximum workers belong to class III 47%, of which 53.19% belonged to Group A and 46.81% belonged to Group B, followed by class IV, that is, 37%. None of the workers belonged to lower class, that is, class V [Table 4]. 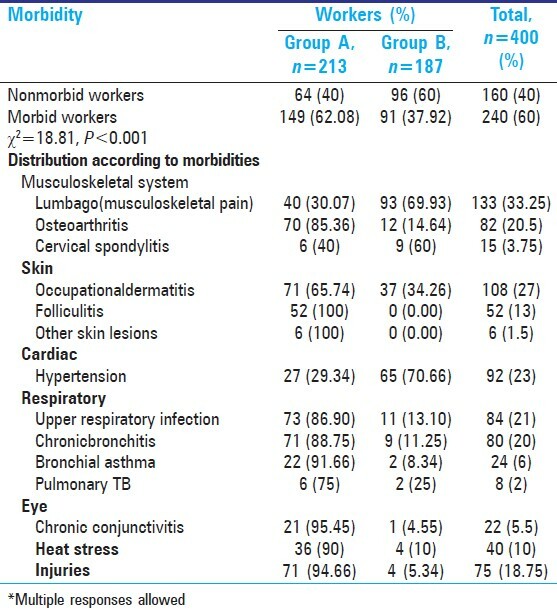 [Table 5] shows that distribution of workers according to type of morbidity they are suffering from.It was seen that all the morbidities were more prevalent in EG, that is, Group A and the difference of prevalence of morbidities between Group A and B was found to be statistically highly significant (P < 0.001), except the musculoskeletal disorders in which difference in prevalence was not statistically significant. It was observed that commonest morbidity in the workers was lumbago (musculoskeletal pain), that is, 33.25%, which was more in Group B (69.93%) than Group A (30.07%); followed by occupational dermatitis (27%), which was more common in Group A (65.74%) than Group B (34.26%). It was observed that occupation-related morbidities were more common in Group A like occupational dermatitis (65.74%; Group B-34.26%), bronchial asthma (91.66%; Group B- 8.34%), tuberculosis (75%; Group B- 25%), chronic bronchitis (88.75%; Group B- 11.25%), folliculitis (100%; Group B-0%), injuries (94.66%; Group B-5.34%), heat stress (90%; Group B- 10%), chronic conjunctivitis (95.45%;Group B- 4.55%). Hypertension was seen in 92 (23%) workers. This cross-sectional study was conducted in an iron and steel Industry among 400 workers. These workers were divided into two groups. Group A consisted of workers who were exposed to risk factors and Group B consist of workers not exposed to risk factors. Out of total study participants, Group A consisted of 213 (53.25%) workers; whereas, Group B consisted of 187 (46.75%) workers. Present study shows majority (30%) of workers were having education up to middle school followed by up to high school (24.25%). Education of workers in two groups was not similar. In Group A, majority of workers were having education up to middle school; whereas in Group B, majority was having education up to high school. Overall Group B was having higher education level. This might be due to inclusion of administrative group in Group B. In present study, majority (38.75%) of workers were having service for more than 20 years, followed by 10-15 years. This shows inclination of workers towards working for long period in this factory. This also shows that majority of workers had exposure of this factory for more than 10 years. In current study, overall prevalence of morbidity was 60%. The percentage of morbidities was higher in Group A (62.08%) than Group B (37.92%), which was statistically significant (χ2 = 18.81, P < 0.001). In other studies, prevalence of overall morbidity was varying from 16 to 81%. ,, This might be due to different working conditions, different health facilities, assessment methods, etc. 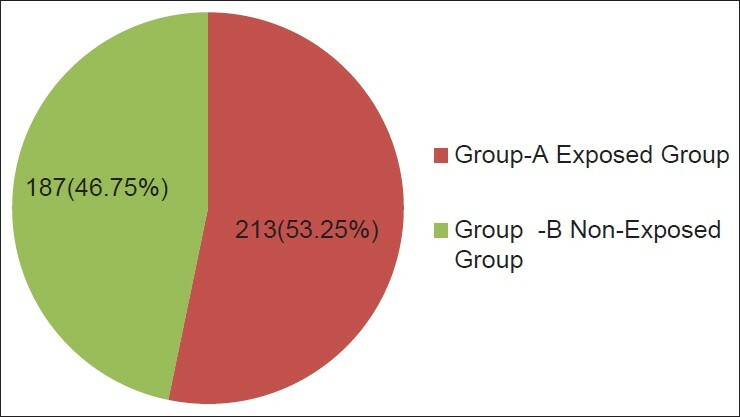 In the present study, workers were grouped as Exposed (Group A) and Non-Exposed (Group B). majority of workers (170,42.5%) belonged to age group of 35-44 years, of which 86 (50.59%) were in Group A, while 84 (49.41%) were in Group B, followed by 114 (28.5%) in the age group of 25-34 years. All the workers were male. Majority of the workers were educated upto middle school, that is, 120 (30%). Most of the workers were working for more than 20 years (155,38.75%) in the factory, in the same department without replacement and were exposed to hazards of industry for the long period. According to the classification of Modified Prasad's Scale, 188 (47%) workers belonged to class III, of which 100 (53.19%) belonged to Group A and 88 (46.81%) belonged to Group B, followed by class IV (37%), and only 2% workers belonged to class I. The overall prevalence of morbidities in the factory workers was 60%, that is, 240 workers were suffering from some form of morbidity. The percentage of morbidities was higher in Group A (69.95%) than Group B (48.66%) and when statistically tested, it was found to be significant (P < 0.001). In the present study, it was observed that commonest morbidity in the workers was lumbago (musculoskeletal pain) which was more in Group B (49.73%) than in Group A (18.78%), followed by occupational dermatitis (27.00%) which was more common in Group A (33.33%) than Group B (19.79%). It was observed that the occupation-related morbidities were more common in Group A; like contact dermatitis, bronchial asthma, tuberculosis, chronic bronchitis, folliculitis, injuries, heat stress, and chronic conjunctivitis; were more common in group A than that in Group B. It was seen that all the morbidities except musculoskeletal disorders were more prevalent in EG, that is, Group A and the difference of prevalence of morbidities between Group A and B was found to be statistically highly significant (P < 0.001). Out of 400 workers, 213 (53.25%) workers were directly exposed to the hazards of iron and steel industry as they were working in production department and 187 (46.75%) were working in administrative department and so were unexposed or not directly exposed to the hazards of the factory. The prevalence of morbidities among the workers was 60%. The most common morbidity was musculoskeletal disorders. Other occupation-related morbidities like bronchial asthma, tuberculosis, chronic bronchitis, folliculitis, injuries, heat stress, and chronic conjunctivitis were more common in EG; and the difference between the groups was found to be statistically significant (P < 0.001). A thorough preplacement medical examination should be conducted for all workers and then departments should be allotted accordingly. The records of the medical examination should be maintained and periodical examinations should also be done. Looking at prevalent morbidity pattern among Group A workers, they should be imparted necessary health education periodically for reducing prevalence of lumbago, dermatitis, workplace injuries, and chronic bronchitis. There should be regular shuffling and substitution of workers from higher exposure department to lower one. The workers should be taught about various protective devices and safety measures and importance of their use for prevention of occupational diseases. There should be strict laws laid down for the factory for usage of protective devices ergonomic guidelines. Amit C. Recent developments in iron making and steelmaking. J Iron Steel Inst 1995;188:100-4. Abdel GM, Mahrous OA, Salem ME, Al-Batanony MA, Allam HK. Auditory and respiratory health disorders among workers in an iron and steel factory. Zagazig J Occup Health Saf 2009;2:1-10. Steelworld.com. Steel production 2012.2013. Available from: http://www.worldsteel.org/statistics/statistics-archive/2012-steel-production.html [Last cited on 2013 Dec 12]. Manjunatha R, Kiran D, Thankappan KR. Sickness Absenteeism, Morbidity and Workplace Injuries among Iron and Steel workers - A Cross Sectional Study from Karnataka, Southern India. Australas Med J 2011;4:144-7. Mikheev M. New epidemics: The challenge for international health work. In: New Epidemics in Occupational Health. Helsinki: Finnish Institute of Occupational Health; 1994. Leigh J, Macaskill P, Kuosma E, Mandryk J. Global burden of disease and injury due to occupational factors. Epidemiology 1999;10:626-31. Nihfw. National Programme For Control and Treatment of Occupational Diseases. NIHFW; 2009 Available from: http://www.nihfw.org/NDC/DocumentationServices/NationalHealthProgramme/Nationalprogrammeforcontrol.html [Last cited on 2013 Dec 12]. Wanger NL, Wagner PJ, Jayachandra P. Learning courses in occupation medicine and good practice. Indian J Occup Environ Med 2005;9:57-61.
WHO. Regional strategy on Occupational and Safety in SEAR Countries. New Delhi: World Health Organization; 2005. Swash M. Hutchison's Clinical Methods. An integrated approach to clinical practice. 21 st ed. San Diego: Harcourt publishers Limited; 2002. p. 46-86, 134-154, 289-302. The Seventh Report of the Joint National Committee on Prevention, Detection, Evaluation, and Treatment of High Blood Pressure. Bethesda: National Institute of Health and The National Heart, Lung, and Blood Institute; 2004. p. 1-11. Pandit K, Tiwari RR. Morbidity profile of steel pipe production workers. Indian J Occup Environ Med 2008;12:88-90. Bradshaw LM, Fishwick D, Slater T, Pearce N. Chronic bronchitis, work related respiratory symptoms, and pulmonary function in welders in New Zealand. Occup Environ Med 1998;55:150-4. Yerpude PN, Jogdand KS. Morbidity profile of cotton mill workers. Indian J Occup Environ Med 2010;14:94-6. Aghilinejad M, Choobineh AR, Sadeghi Z, Nouri MK, Bahrami Ahmadi A. Prevalence of musculoskeletal disorders among Iranian steel workers. Iran Red Crescent Med J 2012;14:198-203. Bihari V, Kesavachandran C, Pangtey BS, Srivastava AK, Mathur N. Musculoskeletal pain and its associated risk factors in residents of National Capital Region. Indian J Occup Environ Med 2011;15:59-63. Masset D, Malchaire J. Low back pain. Epidemiologic aspects and work-related factors in the steel industry. Spine (Phila Pa 1976) 1994;19:143-6. Karnaukh NG, Petrov GA, Antonik IP. Morbidity with temporary loss of work capacity in workers in the operational jobs of the main metallurgical manufactures. Lik Sprava 1998:35-8. Obtulowicz K, Kolarzyk E, Laczkowska T, Porebski G, Zapolska I, Hudzik A. Occupational allergic diseases in the steel industry. Population studies. Przegl Lek 2000;57:446-50. Deepalakshmi K, Johnson P, Pathmavati R, Thangavel G, Jayachandra P, Ayyapan R, et al. Noise induced hearing loss and hypertension in industrial workers - A cross sectional study. Natl J Physiol 2013;1:6-10. Narlawar UW, Surjuse BG, Thakre SS. Hypertension and hearing impairment in workers of iron and steel industry. Indian J Physiol Pharmacol 2006;50:60-6. Barhad B, Teculescu D, Craciun O. Respiratory symptoms, chronic bronchitis and ventilatotory function in shipyard welders. Int Arch Occup Environ Health 1975;36:137-50. Lowe CR. Chronic bronchitis and occupation. Proc R Soc Med 1968;61:98-102. Kolarzyk E, Stepniewski M, Zapolska I. Occurrence of pulmonary diseases in steel mill workers. Int J Occup Med Environ Health 2000;13:103-12. Omoti AE, Edema OT, Akinsola FB, Aigbotsua P. Non-traumatic ocular findings in industrial technical workers in Delta State, Nigeria. Middle East Afr J Ophthalmol 2009;16:25-8. Dada VK, Dhir SP, Goswamy S, Mehta MG, Agarwal LP, Sarma MA, et al. Visual screening in industrial workers. J All India Ophthalmol Soc 1968;16:232-7. Agrawal OP. Profile of burn injury in steel industry. J Indian Med Assoc 1990;88:4-6. Australia SW. Work-related injuries experienced by young workers in Australia, 2009-10. Canberra 2013.